19mm hole green plastic mesh, ideal for garden fencing or debris mesh. 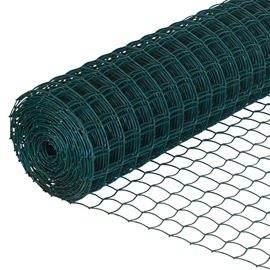 50mm hole green plastic mesh, perfect for garden fencing or climbing plants. Ideal for fences and general purpose garden mesh. The mesh has smooth edges on the top and bottom. The 19mm mesh is used for fencing and also to protect grass e.g. from wheel barrows.